In this Green Star GS-1000 Review, I will be going into the features, pros and cons to help you make a better purchase decision. The Green Star GS-1000 is one of the most remarkable juicers around, combining food and juice processing in one handy package. While it is powerful enough for daily use, the GS-1000 is compact and portable, allowing you to bring it with you anywhere. And if you’re looking for a juicer that won’t stall when juicing hard veggies, the GS-1000 has got you covered. There is an auto-pulp ejection built in so you can juice continuously. Like the other Green Star juicers, the GS-1000 has a heavy duty twin gear juicing system, more powerful than those in standard juicers. Bioceramic and magnetic technologies are built in that allows the juicer to extract more nutrients and minerals. There is a built in mechanism that can remove all unwanted fibers from your juice. There is a fine screen designed just for juicing vegetables. The juicer has a coarse screen if you want the juice to be pulpier. There is an adjusting knob that allows you to precisely control pulp pressure. With this knob, you can extract the maximum amount of juice from any fruit or vegetable. The GS-1000 comes with a cleaning brush, plastic plunger, wooden plunger and a glass juice pitcher. The GS-1000 has a carrying handle so you can move it around. The warranty is good for 5 years. The juicer is easy to use, with operations strictly one-touch. 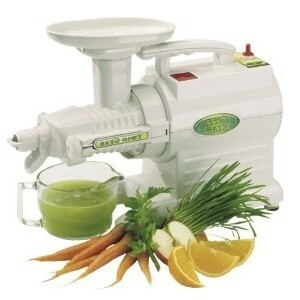 The motor has a capacity of 190 watts (1/4 hp), more powerful than other juicers in its category. 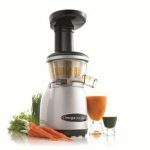 This power allows the juicer to extract juices from rhubarb, celery, ginger, carrots and other leafy greens and hard roots. 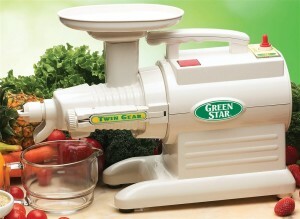 The Green Star GS-1000 can process whole foods, frozen fruit desserts, and pates from nuts date pie crusts and more. There is an electrical cord storage compartment so it stays out of the way. You can buy accessories for the GS-1000 to enhance its ability, such as a mocha maker, pasta maker and an adjusting knob for the juicing soft fruit. The built in homogenizing blank makes it easy to make fruit sorbets, baby foods and batter. At 110 rpm, the juicer doesn’t heat as quickly as other juicers. 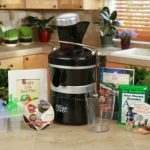 It doesn’t make a lot of noise, a problem that is common with other juicers when they are extracting juice from fruits or vegetables. 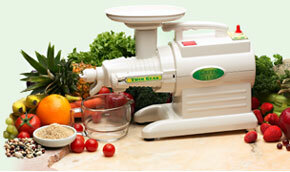 The juicer isn’t just easy to use but runs cleanly, with no greasing or leaking. The GS-1000 has many parts and it requires some assembly. However, the detailed manual will help you with this process step by step. The juicer can process vegetables with no problem, but not as fast as it can process soft fruits. A lot of customers agree that the GS-1000 is one of the best juicers around, far exceeding other centrifugal and masticating juicers in terms of performance, reliability and features. Many reviewers also note how dry the pulp is after juicing, a testament to the GS-1000 efficiency. 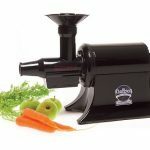 Not all reviews are positive of course, with some customers saying that the juicer is just too complicated to assemble. But as stated earlier, this only becomes a problem if you don’t follow the instructions in the product manual. 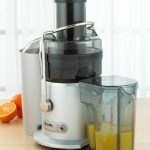 Should You Buy the Green Star GS-1000 Juice Extractor? The GS-1000 is one of the bestselling juicers around and it’s easy to see why. Fruit juices are extracted to the fullest and all the nutrients and vitamins that you need are preserved. If you love wheat grass and tired of other juicers that make a mess of it, then the GS-1000 is what you are looking for. Unlike other juicers, it only requires a little bit of pre-chopping before you can push the fruits into the unit. 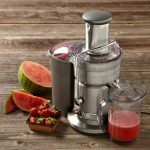 Built not just for fruits but also vegetables, you’ll no doubt enjoy using this juicer for years to come. The five-year warranty, not to mention the testimonials from customers, proves that the Green Star GS-1000 is built to last.